Nexus presents the traditional rhetorical modes as different ways of thinking about our contemporary world, no matter the medium. It builds on students’ multimedia communication skills by using a mix of readings in contemporary and traditional genres to improve students’ college writing skills. Nexus starts where students’ interests lie—with engaging essays, interviews, blog conversations, Web sites, and YouTube videos. These “readings” are presented in a lively, highly visual format that draws on the daily environment in which students are immersed, including electronic and visual sources that are stimulating, energizing, and directly related to topics they are studying. 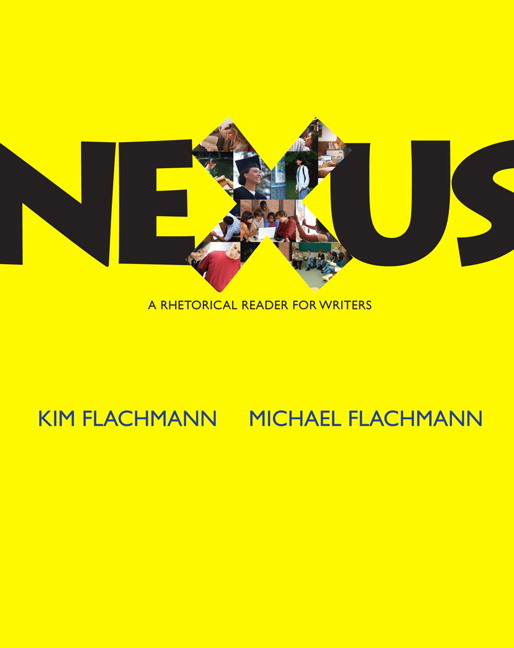 While the format of Nexus is contemporary and stimulating, the content is substantive and pedagogically sound. Students are asked continually throughout this text to pull ideas from multiple media and respond to them first with critical thinking and writing and then by creating a project through a written, oral, visual, or electronic medium of their own choice. · Each modes chapter contains seven readings in a highly visual format—four conventional models (like essays, interviews, or speeches) and three nontraditional texts (like blog conversations, images, songs, collages, and Web sites)..
· Chapter 13, Argument, features ten essays and six nontraditional selections, with individual arguments as well as two clusters of multiple viewpoints on climate change and privacy. o Chapter 1, Our Multimedia World, introduces students to the wide range of texts in this book. o Chapter 2, Reading for Understanding, explains the interactive process of reading graphic and verbal texts. o Chapter 3, Writing for Understanding, discusses various aspects of the writing process. o Chapter 4, Working with Sources, demonstrates how to use sources in a documented essay. · Each modes chapter begins with a brief explanation of thinking in that particular rhetorical mode. This method of critical thinking is highlighted throughout the chapter as a means of processing information in both reading and writing. · The readings helpstudents to think rhetorically by providing ample context including genre, a brief author biography, provocative prereading questions In Context boxes with background information, and a running glossary at the bottom of each page. o Conversations: Collaborating in Class and Online. These questions help students enter a larger conversation on the Nexus Facebook page or in class discussion. o Connections: Discovering Relationships Among Ideas. These questions encourage students to think more deeply about the subject of the reading. o Presentation: Analyzing the Writer’s /Artist’s Craft. These questions focus on the structure and style choices the author or artist made to create the selection. o Projects: Expressing Your Own Views. These prompts ask students to create verbal, visual, and electronic projects. o Other Resources provide one scholarly article and two Web sources to extend the reading. Quick Response (QR) codes allow students to access the Web sites with their smartphones. o Each chapter concludes with twelve Writing Assignments. These ask students to make connections among selections, explore the chapter’s rhetorical mode, combine modes, and grapple with more complex ideas. · End-of-text Editing Reference Guide provides additional support for writers. This guide focuses on ten common grammar and mechanics errors writers make and shows students how to recognize and correct them. · The Ebook within MyCompLab increases flexibility for students who prefer studying online. Essay: "Letter From Birmingham Jail, April 16, 1963," Martin Luther King, Jr.